Last week, I had the rare double pleasure of discovering an excellent fine dining venue and a fellow über aficionado of gourmet delights. After a conference in Brisbane, I headed out for dinner with fellow conference goers Cameron and Katie (who like me also happened to be the final stragglers at the post-conference drinks). Earlier that day, I’d googled the “best restaurants in Brisbane” and found a Courier Mail article which offered a top 10 list. Cameron, from Australia’s gourmet capital Melbourne, was naturally up for some good food. 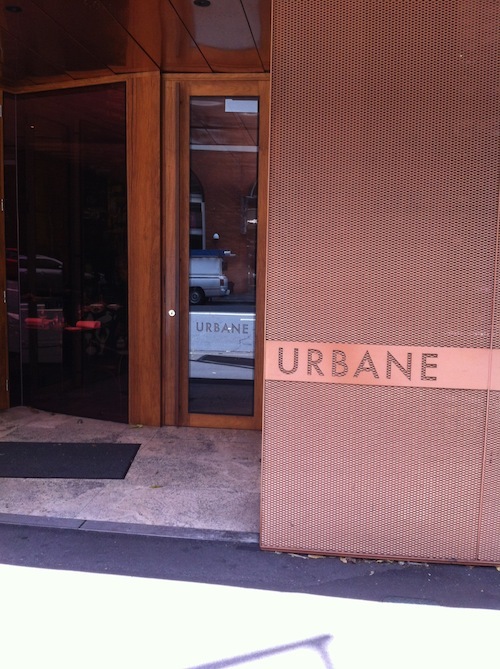 Katie, the local, helped us pick the closest restaurant on that list within walking distance – Urbane on 181 Mary Street, Brisbane. Urbane sports a discreet entrance, particularly at night, and when you walk in, it is a minimalist oasis of calm – dark shadows and pools of light – with the tables set far apart from each other to further extend the feeling that you almost have the place to yourself. The service is discreet, calm and sophisticated; the two Sarahs looking after us executing an excellent tandem act of bringing us food, presenting and explaining the dishes, making sure we remained watered (or wined, as was more the case) and never being far away. And they never, ever avoided making eye contact or pretended not to notice us when we needed something. Let me digress for a pet gripe: waiters who avoid eye contact are one of the most annoying things I frequently experience in Perth restaurants, even those who self-style themselves as "fine dining" venues (if you expect me to wave my arms around like a bloody aircraft carrier flight-deck operator just for the privilege of asking you to bring me the bill, you can forget about any kind of tip!). We ordered the 5 course degustation (although I was sorely tempted by the 9 course marathon offering, my fellow diners were not hungry enough). But it was kind of 11 courses anyway, since we received 6 canapé-sized pre-dinner morsels in succession while we waited for the main event to begin. 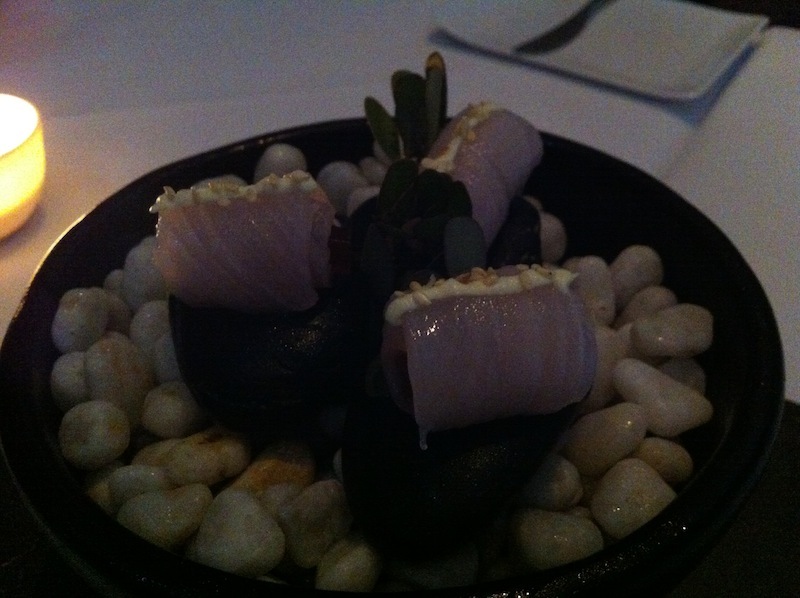 All were delightful, served upon unique and clever vessels (such as a pot of pebbles and a wooden rack of test tubes); with some exquisitely prepared and presented (like the Kingfish Sashimi). 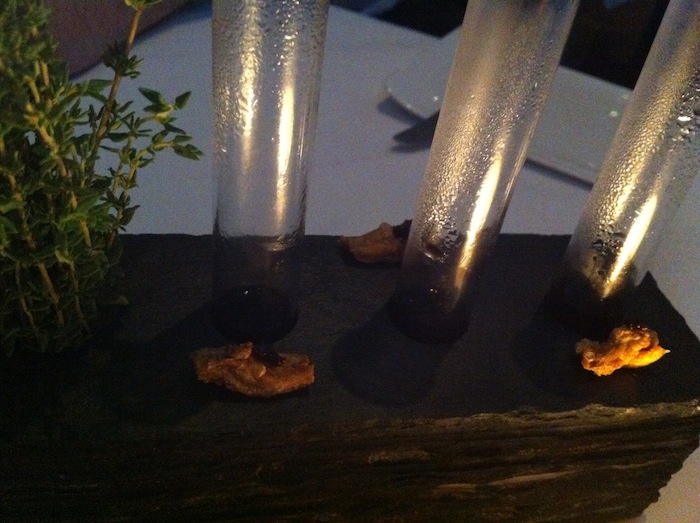 These canapés kept us going while the kitchen prepared the main courses; my favourite of the lot was the richly flavoured duck consommé served in test tubes, accompanied by a crispy dry duck tongue (!) that had the taste and texture of popcorn. As anyone who’s been adventurous with dim sum in Hong Kong would know, the texture of a duck tongue is moist, crunchy and gristle-chewy. So it would have taken some interesting technique to transform this little morsel into displaying a dry popcorn-like texture. The “main” courses each had one feature ingredient, accompanied by other things, featuring an interesting mix of fresh ingredients and what I would best describe as molecular methods. 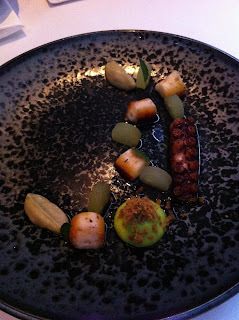 It’s hard to talk about highlights when every dish is an amazing dish, but my pick out of the 5 “main” courses would have been the very pretty looking octopus bits accompanied by delicate pieces of crunchy (but somehow colour-infused) green apple and dollops of avocado and rye mousse. 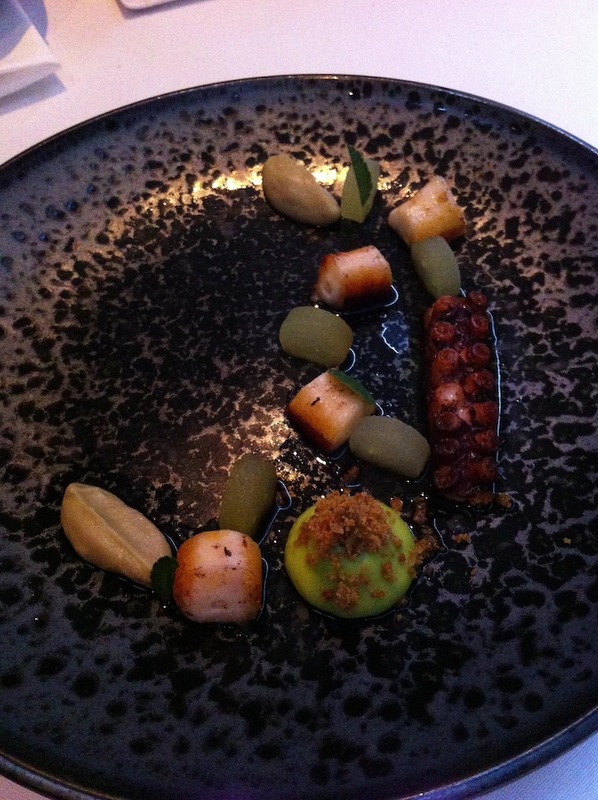 Beautiful, fresh, simple and complementary flavours. Sometimes the best things are the simplest ones. 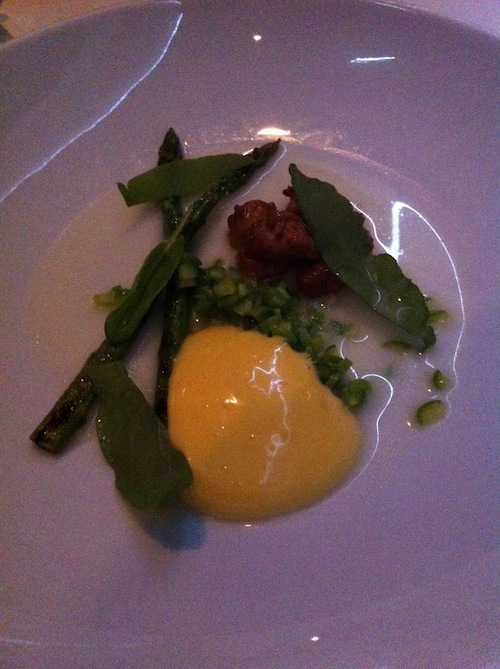 I also love sweetbread, so that deserves a mention – perfectly cooked, with just enough caramelised searing for flavour and texture, yet remaining soft and tender when bitten into; and the accompanying "egg yolk" (looking like an emulsified re-constituted yolk creation) seemed to defy the laws of physics: perfectly soft, runny and yet somehow possessing a robust structural integrity that survived the plating and serving process and all that time remaining in situ on the plate without sliding around. Just three items on the plate, but yet again, complementary in a manner as to enhance each others' flavours and textures. Even the dessert, which looked straightforward on the menu, was meticulously made, the "walnut" being a light crunchy ball of walnut confection reminiscent of maltesers in construction, but slightly larger and without the chocolate covering. The chocolate was a beautiful mouthful of soft and moist chocolate cake-like bakeware (at least that's what I thought it was). And the portion was enough for you to enjoy dessert, but not so much as to make you feel stuffed like a Thanksgiving turkey at the end of the meal. You would be wondering which of my dining companions is the über aficionado: when our octopus dishes were delivered to our table, it looked so good that I simply could not resist leaning over to smell the beautiful fresh aromas of the various inhabitants of the plate, despite not knowing my dining companions that well (even serious gourmet friends think I’m strange for doing that – yes Amanda, I’m talking about you). Then as I looked back up, I realised that Katie was doing the same thing, albeit more decorously off a fork. She had an eloquent response for the sniffer-haters – a dining experience must be experienced with all 5 senses. True-dat! This is someone who cooks 3 gourmet courses over the weekend to freeze them up for lunch and dinner during the coming week, runs marathons in her spare time (and sometimes in a catwoman costume …), so good at her hobby that she qualified for the Boston and New York marathons; who was going to wake up at 5am on Sunday morning to do a lazy 25km; and on top of that started up a multi-million dollar business when she was younger, put her sister through uni, and is now an accomplished lawyer. What a woman! C’est pas possible … но это правда! Cameron, Katie and I just kept talking throughout the evening; the flow was natural and happy – there was never a quiet moment, and the allegedly inevitable awkward silence expected for every conversation never eventuated. We spoke about life, family, love and the future. 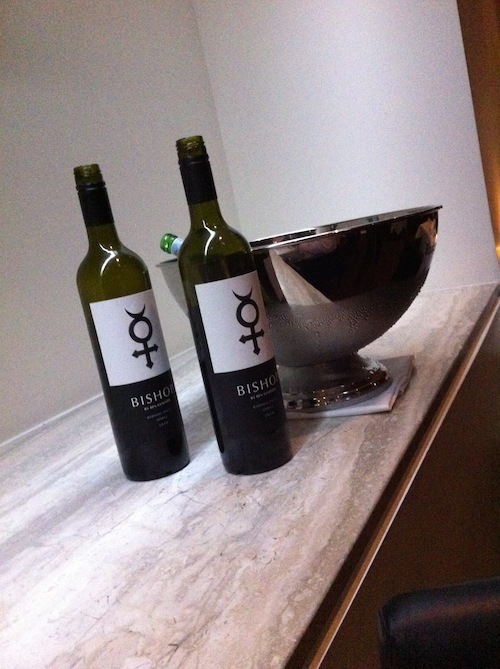 All the while eating amazing food and drinking one of my favourite Barossa shiraz from one of my favourite winemakers – Ben Glaetzer’s 2010 Bishop Shiraz – we polished off two bottles without even realising it until the dinner was over. Everything about this place was stylish and sophisticated, and showed a lot of forethought. 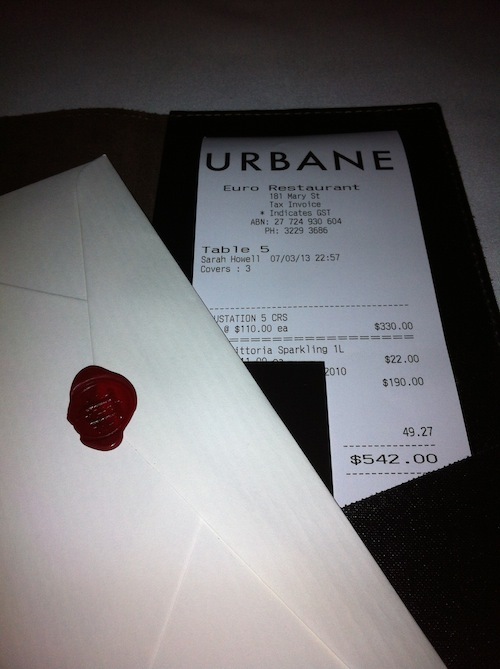 The bill even came in an envelope hand-sealed with red wax (sporting Urbane's "U" logo, no less! ), accompanied by 3 copies of the menu we had enjoyed, so that everyone could take home a record of our experience. A truly amazing evening – beautiful food, enhanced to a new level by wonderful company and conversation; one of the greater pleasures in life – greater because you can’t buy it, nor can you prescribe how to achieve it: it just is or it isn’t.